I've raved about this product in a few of my videos on YouTube, and thought it was time to bring it to the blog! As of quite recently, Barry M have been blowing me out of the water with their new product launches, and by far this Radiant Rod has been the highlight (hahaha) of those products. This highlighter comes in the form of a chubby pencil, that you can wind up and down, with a clear lid that fits tightly over the top. I'm actually a fan of the packaging, as it makes it simple to use, but is effective. With Summer in full swing, a golden highlighter is perfect for creating that sun kissed glow. This is a cream highlighter, so it's perfect for those days when you want to wear a more natural looking makeup such as with a BB cream, but it's also great to pair underneath a powder highlighter for an intense highlight that will last for hours! This product would also be great for creating the new 'strobing' technique that is overtaking contouring now. I picked mine up from Boots for £3.99. Do you have a favourite highlighter? And what do you think of strobing? Cocoa Brown Fake Tan - The Best Fake Tan EVER? Have you ever looked in the mirror and wondered where your tan went? I feel like in the winter this happens to almost every girl, and I'm no exception. Especially in the winter months, I long for the summer glow (which I'm pretty sure I don't even have in the summer haha). I've never really found that holy grail fake tan, the one that I find myself drawn towards and wanting to use non stop, the was until I was contacted by Cocoa Brown (they sent me the products pictured above - but only for consideration). I think it's important to note two amazing points about this tan. The first is that it is a brown based tan, there is no hint of orange to it which means you get a much more natural looking tan. Secondly, it doesn't have that biscuit fake tan smell, it has a gorgeous fruity scent which is described as 'Tahitian Gardenia'. When applying this tan, I will recommend that you use the mit and start rubbing it in immediately. The reason I suggest this is because it is quite a fast drying tan, which is a nice thing as you're not stood around flapping your arms and legs so you can sit down. Also, as this product is a mousse it means that you don't have to worry about it dripping or spilling. As always, with any fake tan, it is best to wash and exfoliate your skin before applying this tan, that way you ensure an even layer with no streaks, this also increases the longevity of the tan. Cocoa Brown say that the tan should last 7-10 days, but it definitely lasts around 14 days on myself which is a bonus because sometimes you I just can't be bothered to keep applying fake tan every couple of days. Overall, I am completely obsessed with this tan, and would definitely recommend it despite being sent it. Especially as it costs £7.99 per can. This tan is available here (not affiliated). Have you tried this fake tan? What are your thoughts? There are an abundance of face brushes on the market, and I've tried a few to say the least varying from the lower end to the higher end. I've never really fallen in love with one, and kind of thought it was a bit of a hype. Michael Todd contacted me and asked if I would like to try their Soniclear Skin Cleansing system, which is in essence a face brush. I have to say, this is the first facial brush that I have been truly impressed with. The Clairsonic broke me out, and I became scared to use it as many had said that it caused broken blood vessels in the face (causing redness in the cheeks). The Michael Todd Soniclear facial cleansing brush comes with two brush heads, a smaller one for the face and a larger one for the body, and the machine actually knows which brush head you have locked on so it can adjust the pressure of the brush. It uses sonic waves to help cleanse the skin, which can be adjusted according to your skin type, I like to use it on the sensitive skin setting. It is a completely waterproof device, which is brilliant if you like to wash your face in the shower. It also has grips on the sides of the handle, which makes it easier to use. Perhaps my most favourite aspect of this brush is the anti-microbial protection, which is explained as 'SONICLEAR combines LIFE's patent-pending organic antimicrobial technology with another EPA registered LIFE antimicrobial to render microbes unable to reproduce and interfere with their uptake of nutrients. Safe, effective and long lasting, the antimicrobial product protection in SONICLEAR doesn't wash out or wear off so the brushes stay cleaner, fresher for longer.' So basically, this brush head won't allow the build up of bacteria on it!! The above picture is from Michael Todd's website, which shows the difference that the anti-microbial protection can have. It also comes with a charge stand, which is so handy as this doubles up as storage, and you can tell when the battery is full as it has three lights on it which once they are all lit, lets you know. This foundation has been a long time coming for me, as an avid YouTube beauty vlogger and viewer, I've seen some of my American counterparts raving about this foundation for a while now. As per usual, us Brits have to sit and wait for it to finally be released in the UK (does anyone know why we have to wait longer?!). Once it was released I was straight out to buy it, any foundation that claims to be matte, full coverage and long lasting deserves a place in my collection. The foundation I'm speaking typing of? Loreal Infallible 24h Matte foundation, duh! There is no smell to this foundation, which is a huge plus for me, if something is going to sit on my face for most of the day I don't want to be reminded of it. The packaging is great for me too, as I have complete control over how much product I decide to use (which by the way, a little goes a long way! ), and it has a screw on cap which means the foundation is securely locked inside. Oh the formula, how I love thee. Once on the face it is such a lightweight foundation, it feels like I have nothing on, whilst providing full coverage so much so that you can even skip concealer, could we really ask for more?! No need, as it is also the first foundation that claims to be matte and actually is, powder doesn't change the appearance of this foundation it only helps with the longevity, I wore this for around 9 hours and it didn't budge - this was also through exercise. I don't think I would recommend this foundation to those of you with dry skin, as I believe that it would feel uncomfortable on the skin - however you would probably like the original Infallible foundation which slides off of oily skin after around 2 hours. Overall, I am in love with this foundation. I would highly recommend it to those of you with combination/oily skin, and if you have pigmentation or acne that you would like to cover. I have got a first impressions video of this foundation, to watch that click here. What are your thoughts on this foundation? Have you tried it? Do you remember how everyone went beauty crazy over the Too Faced Chocolate Bar palette? At £39 I wasn't too willing to jump at buying it (especially if you've seen the amount of eyeshadow palettes I own!) Move over Too Faced, Makeup Revolution have brought out their own version of your palette and the competition is high! And priced at £7.99, why wouldn't you buy it lets be honest?! 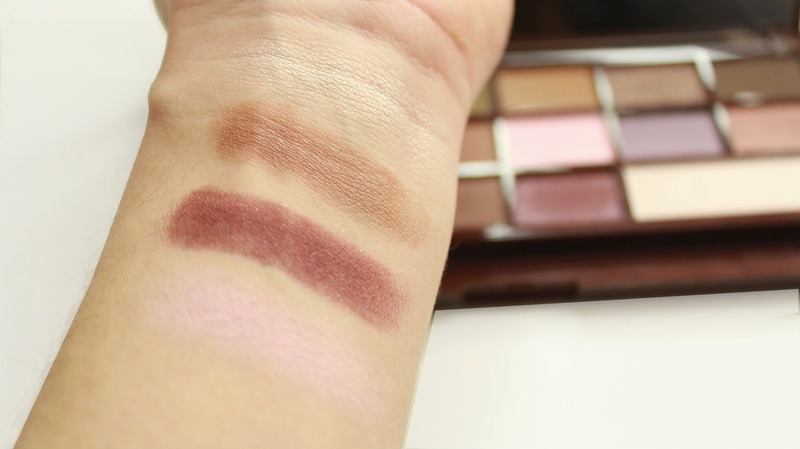 This is the 'I Heart Chocolate' palette, which is from the I Heart Makeup collection by Makeup Revolution. 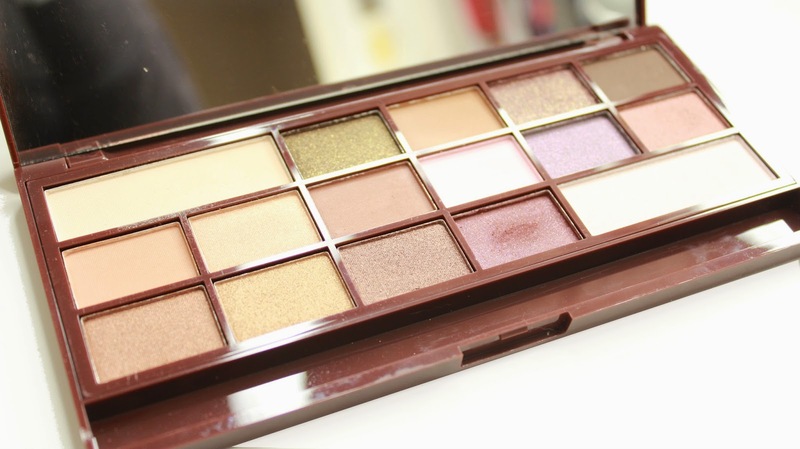 It contains 16 eyeshadows, which range from mattes, shimmers to glitter shadows that are all in a warm tone. 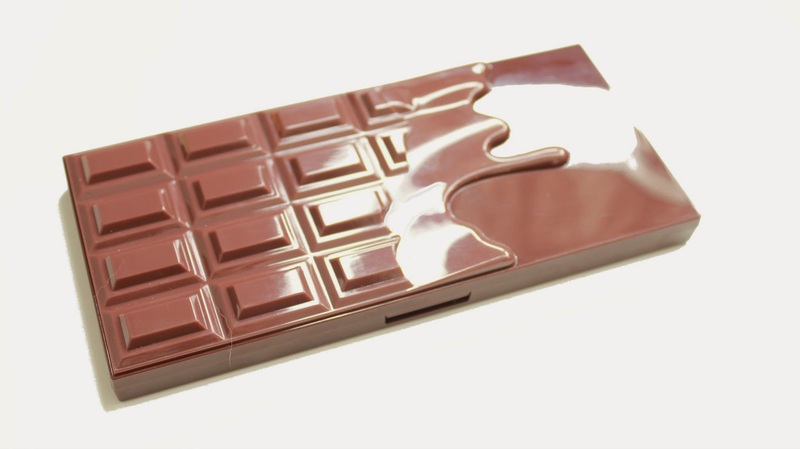 The packaging looks like a melted chocolate bar (be prepared for it to make you hungry!) and inside it has a lovely large sized mirror which is great for helping to create the perfect smokey eye, or natural look that you can achieve with this palette. It does come with a dual-ended brush, however, it's one of those sponge brushes that aren't much use when you are actually trying to create a blended look. My thoughts on this palette are that it is blimmin' amazing! The pigment of these shadows is incredible, as well as the staying power (I haven't used a primer underneath them yet, so I'm sure that would make the longevity 10x better). I would say the eyeshadows have a more powdery feel to them, rather than buttery, but this doesn't take away from the quality of the shadows. And the variation of colours in the palette allows you to create such a wide variety of looks on your eyes, so much so that this palette would become one of your staples in no time! Overall, I'm really happy with this palette and I'm definitely interested in purchasing the other two that they currently have (have you seen the white chocolate one?!) For what it means to you, my recommendation would be that everyone should have one of the chocolate palettes in their collection. 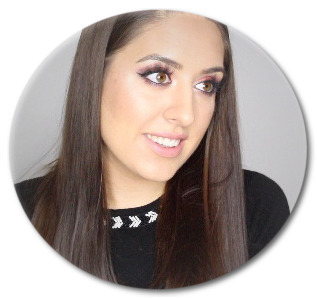 Have you tried anything from Makeup Revolution? What are your thoughts on this palette? Every girl who is obsessed with makeup loves some pretty makeup brushes, but the last thing we want to do is sacrifice great quality for beauty. I'd seen some reviews of the Zoeva brushes, and had always thought about trying them. They are a bit more expensive than other makeup brushes so I wasn't willing to fork out the money any time soon, but then Christmas came along and so did the wish list! The minute I set my eyes on these gorgeous rose gold brushes I was in love, and knew I wanted them. The brushes have a black handle, with rose gold writing on the handle. The metal that helps to hold the bristles in the brush is also rose gold, which is so beautiful and really gives a feminine, luxurious feel to them. The bristles themselves are synthetic, which makes them perfect to use with liquid as they won't soak up all of the product, but they are also perfect to use with powder as well! The 102 Silk Finish brush I love to use for foundation, it gives a really flawless finish, and if you press the foundation into the skin with it, you are poreless too! The bristles on the 106 Powder brush are so soft, that you get a luxurious feel as you apply your powder, who doesn't want that?! The 127 Luxe Sheer Cheek brush is my favourite for blush, I feel like it helps blend out the blush as you apply it - super helpful! I won't go through every brush, but needless to say, I love them all so much and would highly recommend them. This rose gold set costs £55, and they ship to so many countries at a reasonable price. If you aren't interested in rose gold, they do so many other brushes that you will be in heaven! What do you think of these brushes? Have you tried them?